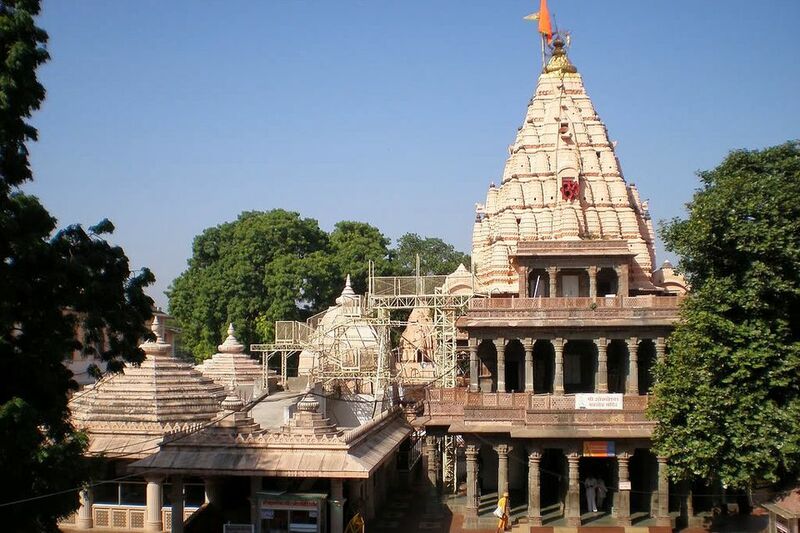 Mahakaleshwar temple at Ujjain, in the Malwa region of Madhya Pradesh, is an important pilgrimage place for Hindus as it's said to be one of the 12 Jyotirlingas (most sacred abodes of Shiva). It's also regarded as one of the top 10 Tantra temples of India, and has the only bhasm aarti (ash ritual) of its kind in the world. What Is the Ash Ritual? The first thing you hear when you tell locals that you’re planning to visit the Mahakaleshwar temple is that you must attend the bhasm aarti. The bhasm aarti is the first ritual conducted everyday at the temple. It's performed to wake the god (Lord Shiva) up, do shringar (anoint and dress him for the day), and carry out the first offering of fire to him (by circulating lamps, incense, and other items). The unique thing about this aarti is the inclusion of bhasm, which is ash from funeral pyres, as one of the offerings. Mahakaleshwar is a name for Lord Shiva and means the god of Time or Death. This may be one of the reasons for the inclusion of the funeral ash. You will be assured that this aarti is something that you shouldn’t miss, and that until fresh ash is not brought in the aarti cannot start. The bhasm aarti begins at 4 a.m. and if you want to offer your own puja (prayer) separately, you'll have to do it after the aarti and you might spend a couple of hours waiting. The aarti is extremely popular and bookings need to be made to see it. This can be done online a month in advance and is recommended. There's no cost. Bookings can also be made at the dedicated counter at the temple entrance the day prior. However, places fill up fast. Do note that there's a dress code when attending the bhasm aarti if you wish to go inside the inner sanctum and participate in the jal abhishek ritual (offering water to the god) before the aarti starts. Men have to wear a traditional dhoti and women must wear a sari. People start lining up at the temple from around 1 a.m. to gain entry, so you'll need to arrive early and wait. Cell phones and cameras are not permitted to be taken inside the temple premises, and security checks are conducted. There's a storage counter where you can leave your belongings. The bhasm aarti commences shortly after the jal abhishek ritual. There are four halls outside the temple's inner sanctum from where the aarti can be observed, some of which have been newly constructed to accommodate more devotees. The differences are in their size and location. Allocation is based on availability when booking. Nandi Mandapam is the preferred hall to be in, as it's smaller (fits only 100 people) and closest to the temple's inner sanctum. The larger Ganpati Mandapam is situated beside Nandi Mandapam and is the next best option, with stairs to sit on for an uninterrupted view. It can fit 400 people. Kartikey Mandapam is a new hall above Ganpati Mandapam. Bhasmarti Mandapam is another new hall located the furthest away. The aarti is telecast onto giant screens while it's being performed. The entire aarti lasts for about 45 minutes to an hour. The first part of the aarti, while the shringar is done, is sublime and well worth the scramble. However, the actual bhasm part — which is often hyped to no end — lasts only about a minute and a half. During this crucial minute and a half that you wait to watch from 2 a.m., women are asked to cover their eyes. It's important to note that the bhasm being used is no longer from funeral pyres but actually just vibhuti – the sacred ash used in most temples, sometimes made from powdered cow dung. After the Lord is adorned in the bhasm, the actual aarti begins, with the offering of the lamps. The aarti is usually accompanied by chants of praises to the Lord. After the bhasm aarti is over, devotees may go inside the inner sanctum and offer their personal prayers to the Lord. Paid Darshan tickets are available for those who don't want to stand for a long time in line. These tickets can be booked online or purchased at the temple.